No discount code required, the promotion will automatically be applied at checkout. Undoubtedly many of the gifts bought this year will be the latest smartphones and smart TV's. We're as fond of our electronic gadgets as anyone, but we also have a closet full of obsolete technology, some only a few years old. Fine gemstones are a very different kind of gift -- formed by lucky accidents of nature millions of years ago, they are often treasured by families for generations. In the colored gemstone world, there are certain gems which have a good record of increasing in value over time. At the top of the list is Burma ruby. These rubies have always been rare, but now production from the Burmese mines has declined and new rubies over 1 carat are non-existent. It's fair to say that Burmese ruby is now approaching the status of Kashmir sapphire, one of the rarest and most valuable of all colored gemstones. In general, sapphires are not as scarce as rubies, but sapphires with top color in larger sizes are still very rare. Fine blue sapphire tends to hold its value best, though rare pink, yellow and padparadscha specimens are also valuable. Blue sapphires in larger sizes are especially sought after by collectors, as are blue star sapphires over 10 carats. There are several other gems that can be classed as investment grade stones: alexandrite, imperial topaz, the rare garnets (demantoid, tsavorite and spessartite) and paraiba and rubellite tourmaline. For gem collectors, any rare and beautiful gem will be appreciated -- exotic gems such as sphene, gem silica, jeremejevite and grandidierite make interesting gifts. In 10 or 20 years when most holiday gifts of 2017 are long forgotten, a fine gemstone will still be a treasured possession. This month we feature some exceptional gems that would a make a uniqe gift for that special person in your life. Click on a photo to see the details for the item. We have just acquired this stunning large Tsavorite Garnet from Kenya! This rare Tsavorite has amazing brilliance with a vivid green hue with just a touch of a blue secondary. This is beautiful crystal, expertly cut with no window, and a very good faceup size for its carat weight. 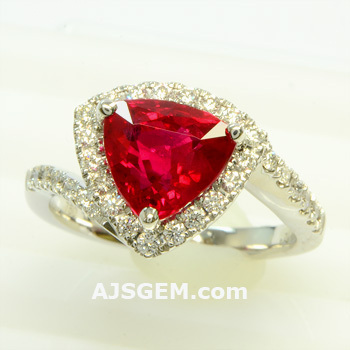 This fine gemstone will set up beautifully in your jewelry design and will be an important addition to any collection. Guaranteed natural and untreated. A splendid large Yellow Ceylon Sapphire in a pure lemon yellow. This impressive gem is clean and expertly fashioned in an elegant cushion. A fine gem sapphire with excellent brilliance, this rare stone will sparkle in any jewelry design. Certified by Gemological Institute of America (GIA). An outstanding matched pair of Morganites from Brazil in an impressive size! Superb color saturation and brilliance, very clean and expertly fashioned in elegant pear shapes. A wonderful set for any collector of fine gems. Guaranteed natural and untreated. This is top grade type-A Jadeite Jade from Burma, completely natural and untreated. It has lovely translucence and luscious vivid green color with excellent even saturation. This gem has an impeccable finish to it, smooth and highly lustrous. Truly a stunning collection-quality gemstone. This fine stone comes complete with a certificate from GemResearch Swisslab (GRS). The GRS lab report result is: Natural Jadeite - Jade, no indications of any treatment. This jadeite is called A-Jade on the Asian market. The largest D-color flawless diamond ever offered at auction sold for $33.7 million at Christie's Geneva auction on November 14th. The 163.41 ct emerald-cut diamond was owned by the Geneva-based luxury jeweler, de Grisogono, and was sold to an anonymous bidder. 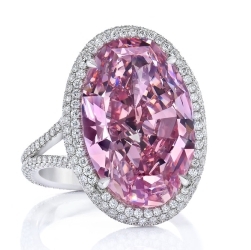 When gemologist and diamonteer Stephen Silver bought a 16.21 ct fancy intense pink diamond in 2013, he noticed that the gem's cut made some areas of the stone appear to be washed out. He saw an opportunity to recut the stone to achieve a higher color grade. Over a period of three years, Silver worked with a master gem-cutter to plot a new cut for the rare pink diamond, cutting it down facet by facet to save the most carat weight while coaxing the gem to yield the highest possible color. The process gambled millions of dollars in lost carat weight if the recut stone failed to raise its color grade as hoped. Finally, a new GIA certificate affirmed that "The Pink Promise" diamond, with its new weight of 14.93 carats, had achieved a Fancy Vivid pink color grading and a significantly higher value. The diamond sold at Christie's Hong Kong sale last month for $31.86 million, a new per-carat record for a pink diamond over 10 carats. We ship by UPS Express, with delivery to most places in the world in 2 to 4 days. Shipments can be tracked online at ups.com while in transit, so you'll know exactly when your order will be delivered. This month you can take advantage of our free express shipping promotion on any order over $300. Most of the latest smartphone screens use some version of Corning's Gorilla Glass which has a Mohs hardness in the range of 6 to 6.5. Most popular gemstones are harder, including sapphire and ruby (9), topaz and spinel (8), aquamarine and morganite (7.5 to 8), garnet and tourmaline (7 to 7.5) and quartz (7). There has been research into using sapphire for smartphone screens, like the sapphire crystals in high-end watches. But hardness is not the only required characteristic for a phone screen -- it also needs to be thin, light and flexible. It turns out that, so far, toughened glass like Gorilla Glass meets the requirements much better than sapphire or any other gem material.